I'm on a zombie kick again. 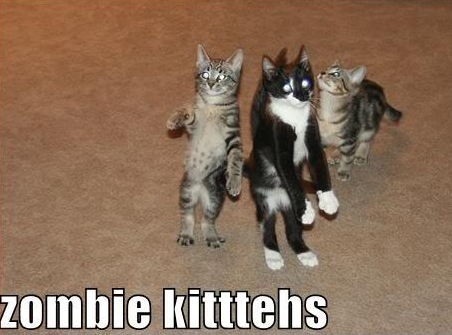 Since I've tried to devote Saturdays, today, to cats; I'm going to theme Sundays on my blog to zombies. Recently I finished Zburbia 2 and had to immediately start the third book in the series, Zburbia 3. I just discovered that Jake Bible, the author, it's going to continue this series with a fourth book. How am I going to read any other book? I have so many. I'm planning on writing up a prepped book for cats and other pets. Think this it's something worth reading? Curious as to what pointers others might have on an apocalypse and the survival and protection of their pets....and perhaps how to convert their pets into the ultimate fighting and defense tool for their bug out routine. Please write any suggestions below.